This is why you don't buy dogs online. Glancing at the opulent white mansion from the sidewalk, it seems just as magnificent as the other homes lining the high-end Wolfeboro, New Hampshire, neighborhood. But what rescuers found hidden inside was nothing short of a nightmare. With months of urine and feces coating the floors under them, dozens of Great Danes sat huddled in corners and behind run-down furniture. They slid around on the thick layer of waste as they tried to walk. 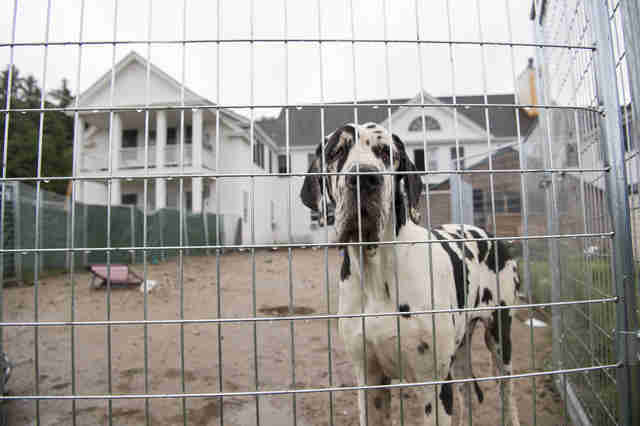 Some dogs stood on top of tattered mattresses and barked out in fear as rescuers walked around the 20-room mansion. 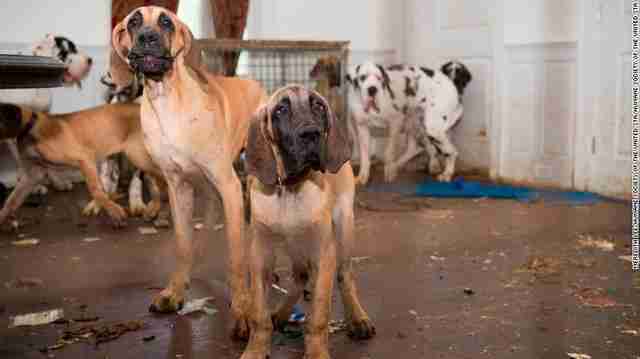 Even more dogs were hidden behind doors and locked in filthy wire cells with no food or water. 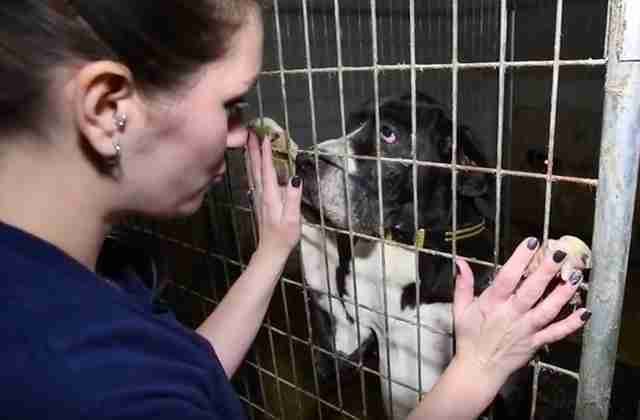 When a rescuer approached one dog’s cage, he stood up and tried licking her hands through the bars. 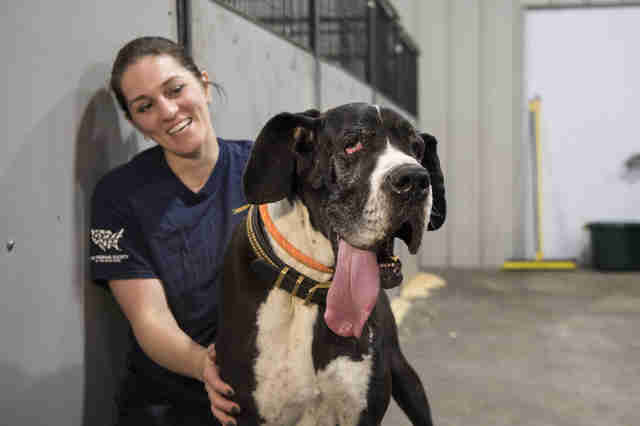 Lindsay Hamrick, the New Hampshire director of Humane Society of the United States (HSUS), said the smell was so strong that the team couldn’t spend more than a few minutes inside without their eyes burning. 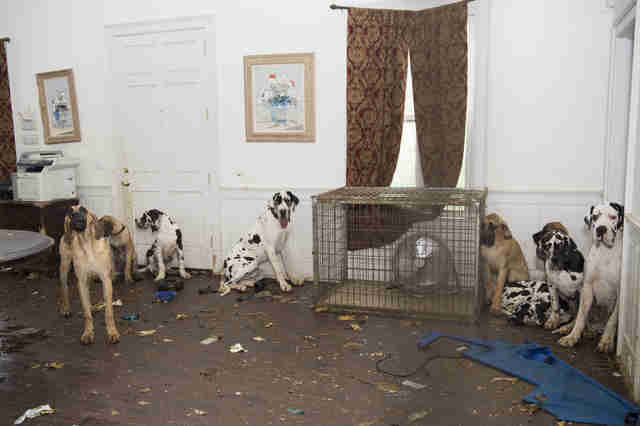 This was everyday life for more than 80 dogs living at the home of Christina Fay, a large-scale Great Dane breeder who, prior to her arrest, sold the dogs online for upwards of $2,000 each. An investigation into the suspected puppy mill was mounted last June when local law enforcement scoped out the property after noise and smell complaints. Police and HSUS seized the dogs soon after and brought them to a shelter built specifically for them. 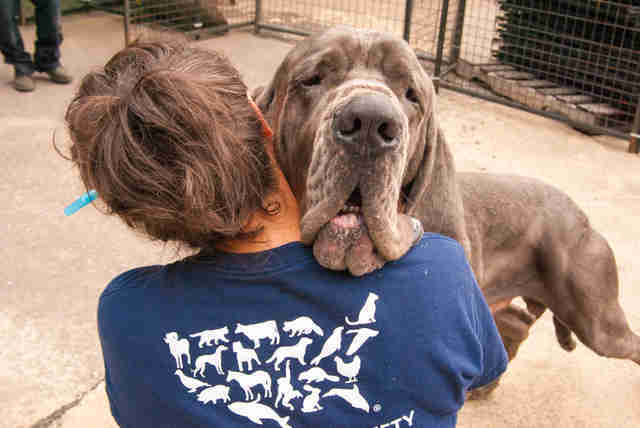 Some of the adult dogs were nearly 200 pounds and could almost look 5-foot-tall Hamrick in the eye while on all fours. The youngest were only 10 days old. The dogs were left without water — but in some areas of the house, raw chicken crawling with maggots was found on the floors for the dogs to eat. Many, in addition to being underfed, were suffering from open wounds and parasites. Despite everything they’ve been through, the dogs have made it clear how overjoyed they are to finally be safe. For the past 10 months, the dogs have been living at the HSUS shelter and continue to receive specialized care for any ongoing health concerns. An appeal in the case at the end of 2017 stalled the dogs from being able to be adopted out. Fay is set to be sentenced on May 11 for 17 counts of animal cruelty, and may receive a lifetime ban on owning animals. Once the case is closed, the dogs will be be transferred to rescue partners across the United States to find their forever homes. To Hamrick, who has seen the neglected dogs transform over the past few months, getting justice and loving homes for the dogs will be the greatest reward. To push for stricter animal cruelty laws in New Hampshire, including a new policy that would require offenders to pay for rescue costs of the animals they have abused, you can urge local legislators to support this bill. To help more neglected animals across the country, you can make a donation to Humane Society of the United States.